After a first half that proved regrettably familiar to this season’s support, Portadown produced a second-half display of previously unseen spirit to finish with a 3-2 victory. The result cut off a run of fixtures without victory at six but the display could prove of greater significance as the Ports finally found a way to transfer the talent on the teamsheet to performances on the pitch. Carrick Rangers took advantage of Portadown’s fragile form to move clear by 2-0 at the break. The hosts’ problems increased when Garry Breen was sent off around 15 minutes after stepping off the sidelines. A Gary Twigg drive and Ken Oman double wrapped up the fightback that provided welcome respite from the rot. Future fixtures must now turn those 45 minutes - plus that crucial injury-time - into the regular rather than a temporary example of potential. 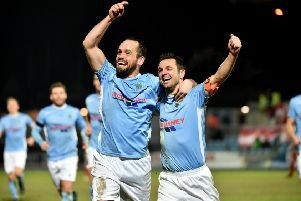 Carrick broke the deadlock on 15 minutes when Conor McCloskey - one of three former Ports players in the visitors’ squad, alongside Aaron Traynor and Joe McNeill - delivered a cross from the right which the unmarked Miguel Chines turned home. It was 2-0 when Chines’ corner-kick was headed home by McCloskey, despite a David Miskelly glove. A second-half response kicked into gear from the first whistle and Twigg squeezed home a shot from distance. It was level when Ross Redman’s free-kick delivery was headed home by Oman. Oman and Redman combined across injury-time for a welcome winning goal as the latter’s corner-kick was diverted in by the former.